For those of you who just can't get enough of "Jersey Boys," take heart. To celebrate the holidays, members of the award-winning "Jersey Boys" casts around the globe have come together to record "A Jersey Boys Christmas," a selection of Christmas classics in the style of Frankie Valli & The Four Seasons. This marks the first time that a Broadway show has released a holiday album. The recording was produced by Bob Gaudio, a founding member of The Four Seasons and the group’s principal songwriter. The musical director and arranger for the project was Ron Melrose, who also arranged music for the "Jersey Boys" stage production. The eclectic album features performances by six stars from the various "Jersey Boys" casts – Joseph Leo Bwarie (a member of the National Touring Company which played Boston twice), Travis Cloer (Las Vegas), Rick Faugno (Las Vegas), Bobby Fox (Australia), Ryan Molloy (London) and Jarrod Spector (Broadway) – plus John Lloyd Young, who won the 2006 Tony Award for his portrayal of Valli in the original Broadway production. .
Other highlights include a doo-wop version of “White Christmas” inspired by The Drifters and “Santa Medley,” which infuses signature "Jersey Boys" harmonies into a trio of holiday favorites. Also featured is a unique version of “Angels From The Realms Of Glory” filtered through ’80s synth-rock with a touch of Beethoven’s “Ninth Symphony” thrown in. 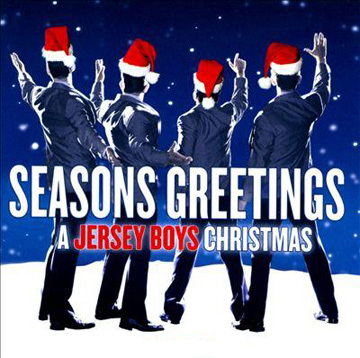 "A Jersey Boys Christmas" is available now in stores, through Rhino Records or at Amazon.com.